Army Chief General Raheel Sharif on Sunday evening visited Civil Hospital Karachi to inquire about the health of those injured in the blast at Shah Noorani shrine in Balochistan's Khuzdar district, which had killed at least 52 people and injured a 100 others, DawnNews reported. IG FC Sher Afgun speaks to journalists. While talking to media earlier in the day, Inspector General Frontier Corps (FC) Major General Sher Afgun said, an initial probe into Saturday night's attack revealed that ball bearings were used, along six kilogrammes of explosive material, in order to inflict 'maximum damage'. 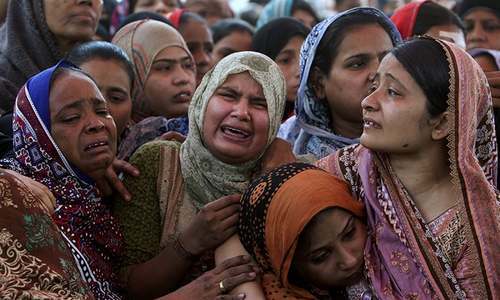 At least 52 people were killed and over 100 others wounded when a teenage suicide bomber blew himself up in the shrine's packed-to-capacity courtyard as the traditional dhamaal was underway. The attack has been claimed by the militant Islamic State group but the government officials are continously denying it, claiming it as a ploy to hinder proper investigations. Over 1,000 people from all over the country, particularly Karachi, were present on the premises when the blast took place. Sher Afgun said six kilogramme of explosives were used in the explosive. "It contained ball bearings and 9mm bullets. That's why so much damage was inflicted." Afgun confirmed. "It was a suicide attack". Balochistan Chief Minister Nawab Sanaullah Zehri announced that FC, Levis and police checkposts will be established around the area. He also promissed a compensation of Rs1 million for the family of the deceased and Rs0.5 million for those injured in the attack. Security officials have been sifting through the debris in order to probe the incident. Strict security measures are to be adopted by the administration in order to avoid any untoward incident. "I am sure the civil administration and other institutions will review security arrangements to pick out the flaws so they can be fixed," the IG FC said. Witnesses said problems responding to the attack were compounded by the fact that it took several hours for rescue services to reach the remote shrine, located in a remote and mountainous area in Khuzdar, several kilometres away from surrounding villages, with poor mobile network coverage. The IG FC visited the site of the attack and met with family members of victims to console them. 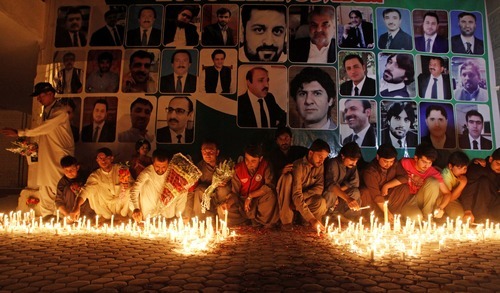 "Terrorists involved in killing innocent people will be brought to book," Afgun vowed. This is the fourth deadliest in Pakistan this year, and the second major assault claimed by IS in the country. Its a shame we are seeing little action....and a lot of photo-ops. It is amazing, how this tragedy has been so easily usurped by the other news. Where is the democratic govt. ?? ?